The word “fracking” is as tied to the state of Colorado these days as “skiing”, “mountains” and “snow”. Fracking is the process of drilling vertically or horizontally far below the surface to inject water, sand. and chemicals at a very high pressure into rocks that are believed to have crude oil and natural gas inside of them. The mixture that is injected into the rock at such high pressure forces the gas to flow into a wellbore which is then extracted at the surface. The first incidences of fracking can be traced back to the 1820’s in New York, when natural gas was first extracted from shale. Further down the road in the 1900’s, fracturing rocks that were believed to have oil in them was explored using nitroglycerin. In the 1940’s big advancements were made in the industry when Floyd Harris of Stanolind Oil and Gas Corporation attempted to inject gasoline and sand to fracture a rock formation at 2,000 and 2,500 feet down with great success. He experimented with this in Grant County Kansas in 1947, and by 1949 the company Halliburton put a patent on the process and began using it in over 300 wells across the country. In 1953 water was used in place of gasoline in the extraction process, and remains the industry standard still today. The first fracking well drilled in Colorado occurred near Boulder in 1901 in the Pierre Shale Formation. At this time oil and gas companies were only drilling straight down, which continued to the be the case until the 1970’s when it was discovered that drilling diagonally allowed underground resources to be reached that were not accessible right below the drilling site. In the 1980’s and 1990’s George Mitchell of Mitchell Energy discovered how to drill horizontally, and created “slickwater drilling”, which added lubricant, biocide, and surfactant chemicals to the water and sand mixture helping prop open the fractures in the rock, and preventing clogs in the well by keeping it lubricated. In the past decade, as it has around the U.S., fracking has become a booming business in Colorado, with most of the wells being drilled in Weld County on the eastern slope near Greeley, and Garfield County on the western slope near Rifle. 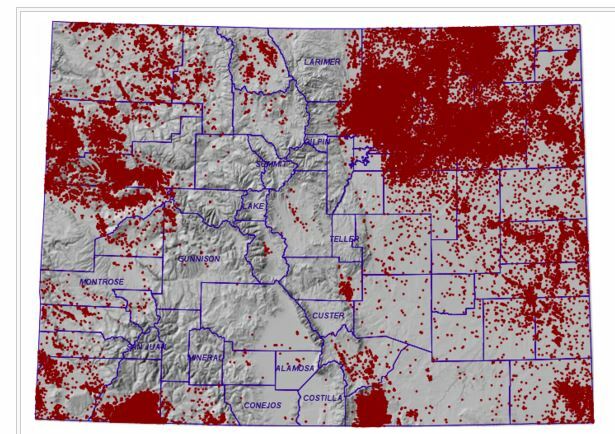 Below is a map from 2017 showing all the oil and gas wells in Colorado. Weld county taps into the Niobrara Shale Foundation, which also covers portions of Kansas, Nebraska, and Wyoming. Shale in the Niobrara Foundation ranges from 900 feet to 1,800 feet thick, and according to the U.S. Energy Information Administration (EIA) the formation produces 1,288 barrels of crude per day, and 4,469 thousand cubic feet of natural gas per day. The crude coming from this area is primarily light condensate crude. In 2009, a well nicknamed “Jake” in Weld county was drilled, and produced an awe inspiring 50,000 barrels of oil in 90 days, and in 2015 Weld county was responsible for 9 out of every 10 barrels of crude oil produced in Colorado. The second largest area in Colorado for fracking is in Garfield County, which gets its resources from the Piceance Basin. The Piceance Basin is thought to have one of the richest and thickest oil shale deposits in the world, and in 2007 contained five of the top 50 U.S. gas fields in proved reserves. Within the Piceance Basin is the Williams Fork sandstone formation, and the Mancos Shale. In 2011 WPX Energy drilled a natural gas formation near Parachute, Colorado, which is located on the Mancos Shale that proved to be so productive the company nicknamed it “the Beast”. 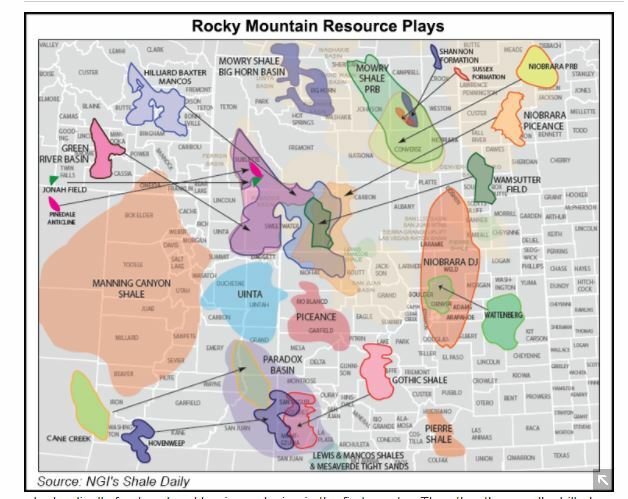 Below is a map of Colorado and all the formations it receives resources from by fracking. The crude oil coming out of these areas is transported mainly by truck to the Suncor Refinery in Denver, according to Paul Rolniak of Energy Analysts International in Westminster, Colorado. It is also moved through the White Cliffs and Magellan pipelines, which then eventually meet the Cushing pipeline. Rail transport is used, but after a Union Pacific train derailed outside of Greeley, Colorado in 2014 spilling 5,000 gallons of oil, truck and pipeline transport remain the more common and reliable modes of transport for Colorado’s crude. Because Colorado is geographically isolated from the bigger refining centers, there is a $12-$14 per barrel discount for the crude coming out of the state. 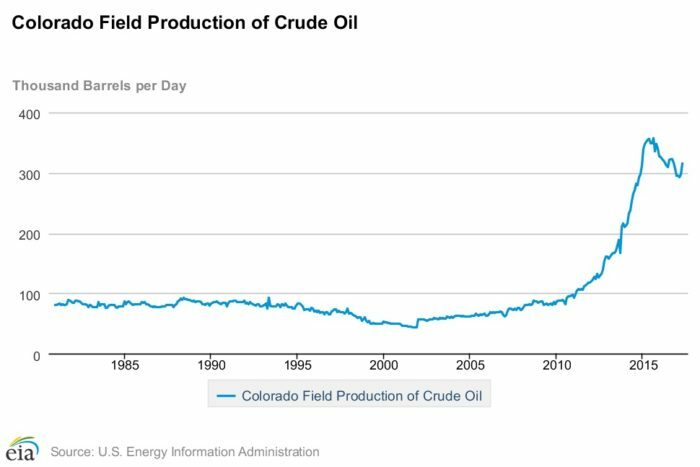 According to information provided by the EIA, Colorado’s production of crude oil picked up significantly in 2010, and has since more than tripled in the last five years to a peak in August 2015 of 357 thousand barrels per day (kbd). There was a decrease in production when oil prices crashed from $100 per barrel to $26 per barrel, but things seem to have found a plateau today at the $45-50 per barrel level. EIA’s latest Colorado production data from April 2017 puts production at 315 kbd. A recent economic report prepared by the Business Research Division of the Leeds School of Business, University of Colorado Boulder for the Colorado Oil and Gas Association found that oil and gas development added $31.7 billion to Colorado’s economy in 2014. The biggest beneficiaries of this were found to be schools (receiving and estimated $178 million) and State Parks and Wildlife (receiving an estimated $0.5 million). The positive economic impact on the state from hydraulic fracking cannot be argued. From the immense creation of jobs, to the investments made in education and transportation, every citizen of Colorado has been impacted by these improvements. Driving from one end of the state to the other on Interstate 70, the landscape is dotted with hydraulic fracking wells as far as the eye can see at the beginning, and end of the journey. Concerned residents of Colorado who live near these areas are worried about groundwater contamination, chemical exposure, air pollution impacts, and fracking-induced earthquakes just to name a few. The Colorado Oil and Gas Conservation Commission oversees regulation fracking in Colorado and enforces regulations on well construction, underground and surface water protection, reporting and disclosure of chemicals used in the fracking process, surface and injection pressure used and spill prevention and clean-up. People on both sides of the issue feel so strongly about their views regarding fracking that it has become a major issue at the ballot box in Colorado. Both opponents and supporters try to get their measures passed by voters each election cycle, and exhaust countless resources to do so. According to the BallotPedia website, in 2012 the city of Longmont passed an initiative that put an indefinite ban of fracking, and in 2013 the same thing happened in the city of Lafayette. In 2013 the cities of Broomfield, Boulder and Fort Collins passed initiatives that imposed five-year fracking suspensions, and in 2014 the city of Loveland defeated an initiative to suspend fracking for two years. The future of hydraulic fracking in Colorado is hazy to say the least. With supporters encouraged by the vast economic improvements that have been achieved in the past decade by fracking, and opponents worried for their land value and the environmental and health impacts it may cause, fracking is a hot topic for many residents of the state. At Stillwater Associates, we look forward to providing you with analysis and information regarding this relevant issue as it continues to impact the industry of Colorado, and the United States.